We donated 815, – Euro and then rounded up to 1000, – Euro and donated to a facility for sick children. We have donated to this facility since the founding of our chapter and are also helping with the summer festival of this facility. We have a close friendship with the affected children, their parents and the caregivers. 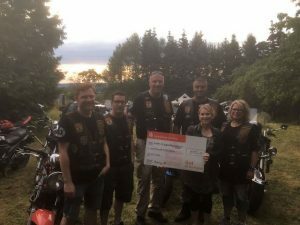 The Red Knights Germany III Chapter in Gießen / Hessen, Germany, is hosting a summer and a winter party every year. The next dates will be on 18 February 2017 and in the summer from 28 to 30 July 2017 on the club grounds.